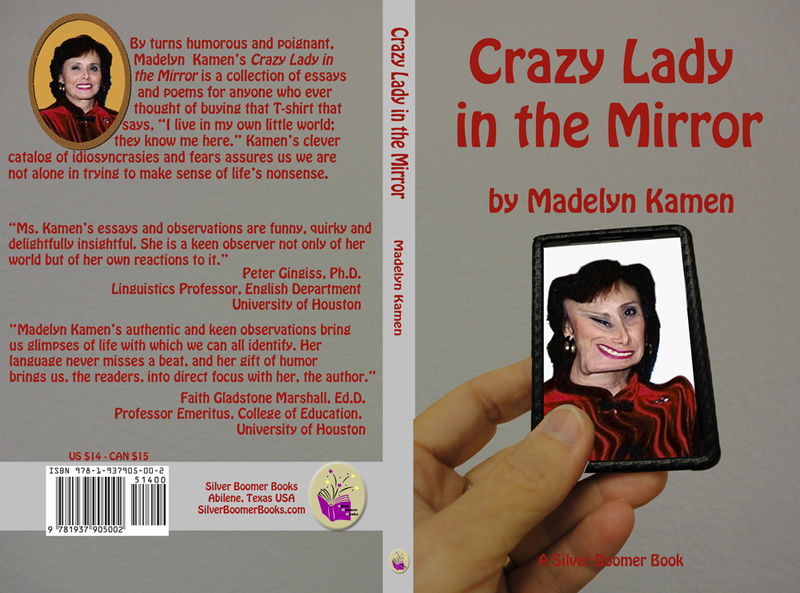 Click the button below to order your copy of Crazy Lady in the Mirror for $14.00 US plus shipping costs and, in Texas, sales tax. Crazy Lady in the Mirror for $14.00 U.S. plus shipping and, in Texas, sales tax. I am perfectly sane. It’s that crazy lady in the mirror who worries me. My world is perfectly normal. Hers is obsessive, compulsive, schizophrenic, depressive, anxious, manic, and hilarious depending on the time of day I see her, how the stars are aligned, if husband A or husband B (split personality guy, I’d say) woke up next to her in bed, what antics her kids have pulled lately, and how many calls she’s gotten from her mother today. I didn’t write this collection of essays, poems, short stories, and rantings. The lady in the mirror did. So, if you are perfectly healthy, never get rattled, never fight with your husband, your kids, or your mother, then, this book is not for you. However, if you ever look in the mirror and see that crazy lady, then you are among friends. I invite you to join the party at the insane asylum where we laugh at ourselves and each other, sometimes until we cry. Don’t worry though. It is all through the looking glass. Come on in. The mercury is fine.